NEW VIDEO! This awesome flavorful dinner is way better than takeout and is ready to eat in 10 minutes!!! Happy Monday! I hope you had a great weekend! Raise your hand if during the Superbowl, you ate enough chips and guacamole to service a Mexican restaurant all by yourself!!! Meeeee…. OMG. Like I need a guac detox… and I am sure I will have a very rough 5:30 am Monday morning workout after all of that indulging. So, in an attempt to get the week off in the right direction, I am sharing with you one of my easiest, fastest and favorite weeknight meals, that feels appropriate for a Monday (because it is SO easy and fast) and this is what I am making tonight for my family! 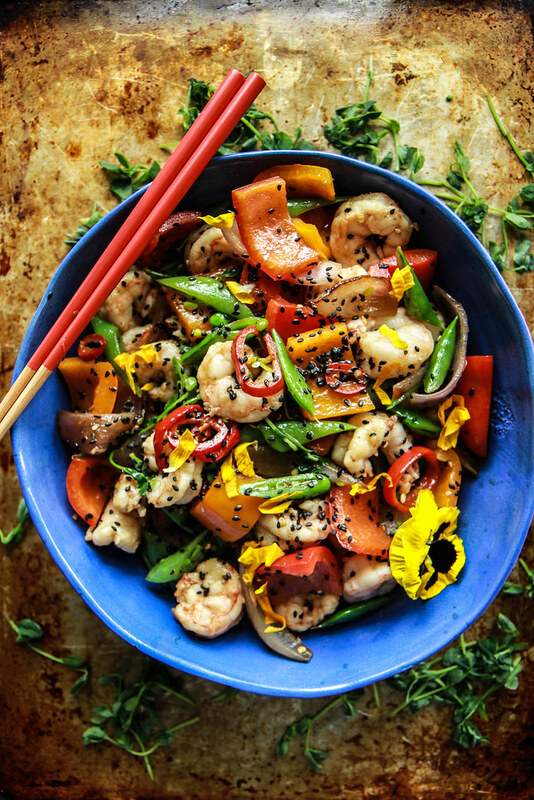 So I’ll stop babbling and let me share this delicious Gingery Sesame Shrimp Stir Fry. I love it with a bowl of Crispy Ginger Rice or even just steamed jasmine rice. But the great thing about this recipe is that even if you opt to not eat it with rice (Paleo/Whole30) or you could do cauliflower rice! it is still so satisfying and super full of flavor. PLUS you can prep and cook the whole thing in 10-15 minutes. CRAZY!!! 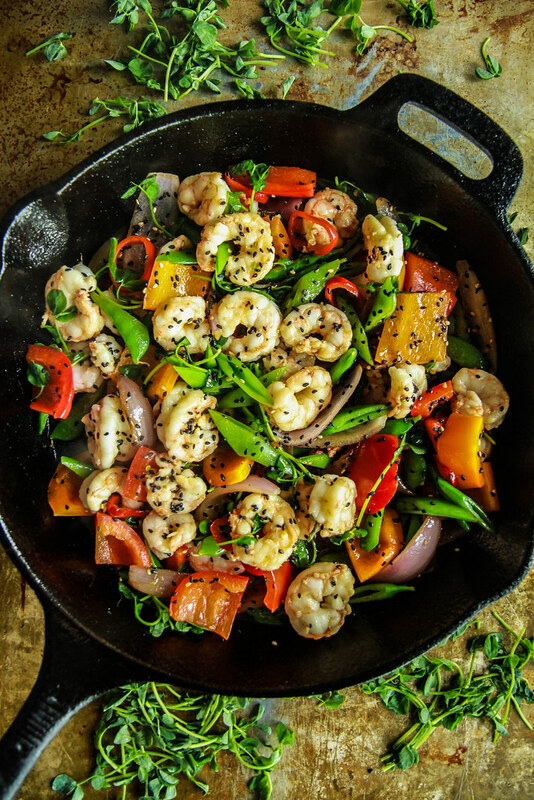 Whisk together the stir-fry sauce in a medium bowl and add the shrimp and toss with the sauce. In a large heavy sauté pan over high heat add the vegetable oil. Add the red onion and cook, while stirring often for about 1 minute. Add the rest of the vegetables and cook for one minute, stirring often. Add the shrimp and all of the sauce and cook, stirring the whole time for about 2-3 minutes until the shrimp are just cooked through and the sauce has thickened. Season with kosher salt to taste. Sprinkle with sesame seeds and serve immediately. I want this for dinner tonight! Loving all the delicious flavors! I need to make this for my family – they would loooove it! This dish looks completely amazing Heather! So adaptable! Love a good stir fry! Those veggies are beautiful in this dish! This looks like crazy-good flavor in a bowl. Good luck with your last week of Whole30! So nice and light, healthy and tasty! This is so delicious! Perfectly heated – my 9 year old loves it! Once we served her, I added a little extra red pepper flakes for my hubby and Me Served over rice! Ha ha. Yeah a guac detox is in order! Lol. Love love love how quickly this comes together. 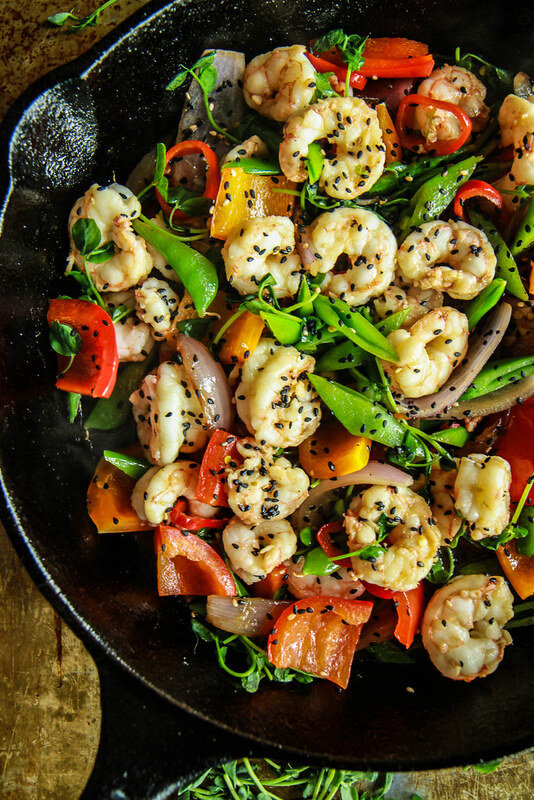 Stir fry is always such a great dinner choice! Who needs take-out when this is SO easy (and healthier!!) to make at home! Looks so delicious! Need this for dinner asap! This sounds perfect! And so quick! May 8, 2018 at 4:11 pm	 C.
Thanks for the recipe, it is great. We tried it and loved it. A few things about this if you are on the Whole30. You should not add the Rice Vinegar (no rice of any kind), or the Tamari for Whole30, as soy and Tamari is a no no. All the rest is great and loved the sauce. I made this dish last night and it was amazing! I can’t wait to try more of your recipes. Thank you! Awesome! thank you so much Dawn!